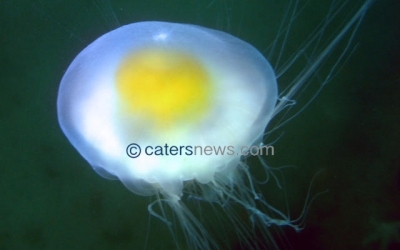 Fried Egg Jellyfish (Phacellophora camtschatica) – this jellyfish is also known as Egg yolk jelly. This jellyfish looks like a fried egg as seen from above. This cool-water species can be found in many parts of the world’s oceans. 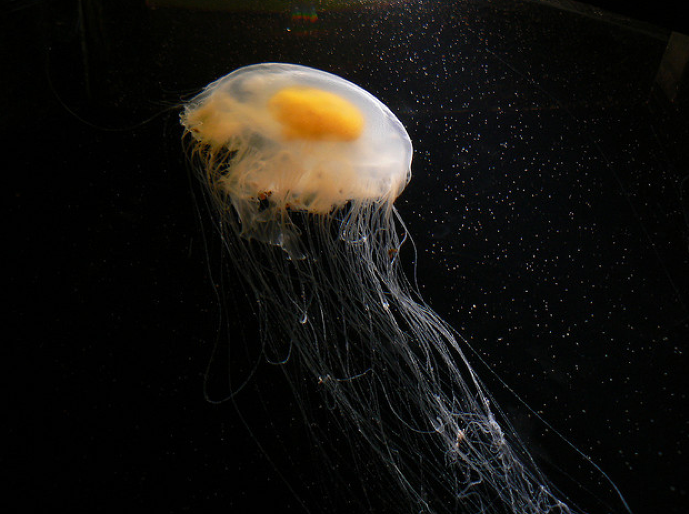 The diet of Fried egg jellyfish is a small fish and small crabs. 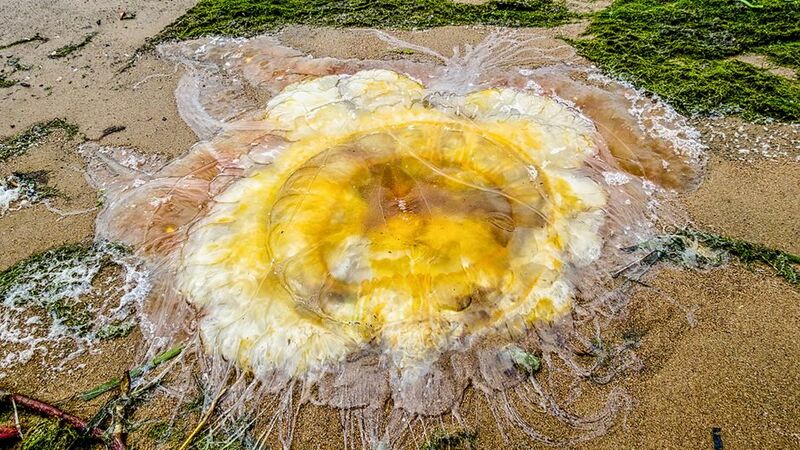 Fried egg jellyfish the size is about 60 cm (24 inches) in diameter. The tentacles can be up to 6 m (20 ft) long. 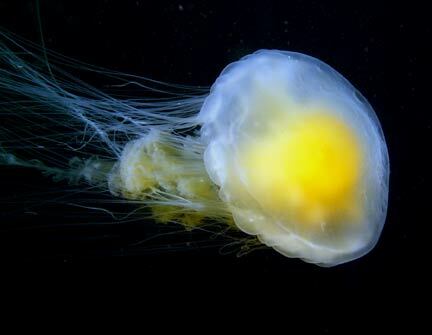 The color of a fried egg jellyfish is a yellow spot in the big bell-like shape. Spends much the time motionless or slowly pulsing the bell while drifting with tentacles extended 10-20 feet or more. Feeds on gelatinous zooplankton, especially other medusae. The colored portion of the body under the transparent swimming bell consists of the gonads, stomach and the oral arms surrounding the mouth. Reproduction is complicated, involving egg and sperm production by the swimming adult or medusa resulting in a planulae larva that seeks a sheltered home. After attachment it grows for a while forming a polyp which then buds off small medusa. In the laboratory it took about 9 months for an ephyra to grow into a mature medusa. The tentacles, which hang down some 10 to 20 ft, contain stinging cells (nematocysts). 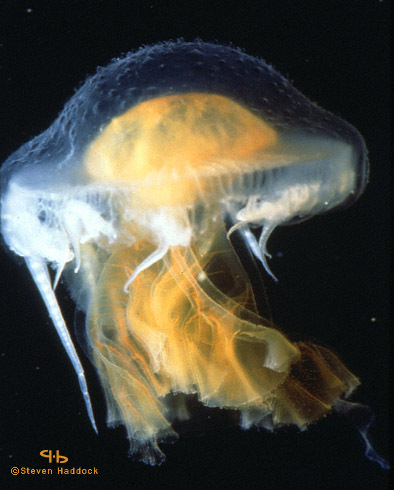 They use the stinging cells to capture prey such as shrimp and fish (Lion’s mane) or other medusa (Fried egg jelly). While the Fried egg jelly’s sting is described as a mild, the Lion’s mane sting can be quite painful. 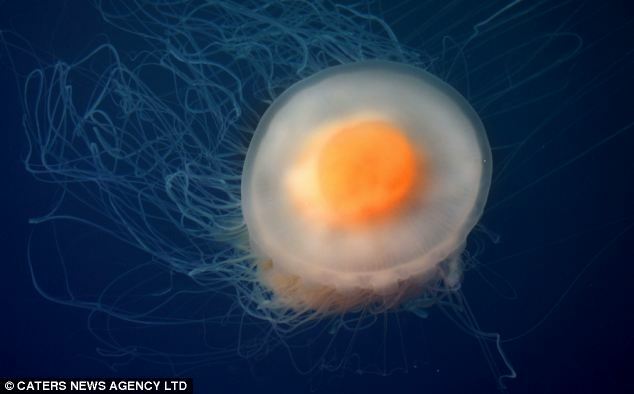 A smaller jellyfish, Cotylorhiza tuberculata, typically found in warmer water, particularly in the Mediterranean Sea, is also popularly called a fried egg jellyfish.